Mayor Anna Peterson was elected as mayor of Salem in 2010 and began her first term in January 2011. She was elected to a second term in November 2012. 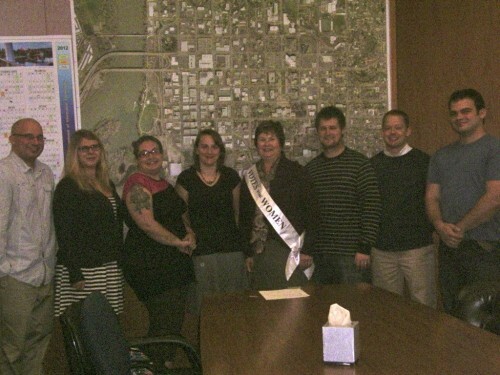 Western Oregon University students interviewed Mayor Peterson as part of their work for History 698: Research Methods in Fall 2012 and they were joined by Professor Kimberly Jensen. They are shown here on October 18, 2012 at Mayor Peterson’s office in Salem, where the interview took place. Left to right, Travis Cook, Kati Greer, Brittney Teal-Cribbs, Jennifer Ross, Mayor Peterson with Votes for Women Sash, Adam Barrett, Justin Devereux, and Gregory J. Garcia. The interview was part of the commemoration of the centennial of the achievement of votes for women in Oregon and Mayor Peterson discussed her role as a female office holder in the state. Portions of this oral history interview have been edited and the complete interview is available at the Hamersly Library Archives at Western Oregon University. Kimberly Jensen: The date is October 18, 2012. We are here at Salem City Hall. Mayor Anna Peterson has kindly agreed to let us interview her. My name is Kimberly Jensen, I am a professor of History at Western Oregon and these are students in History 698, Research Methods: Jennifer Ross, Brittney Teal-Cribbs, Kati Greer, Justin Devereux, Travis Cook, Gregory J. Garcia, and Adam Barrett. Mayor Anna Peterson: All right. Good morning. Welcome everyone. Thank you for being here. This is exciting, I appreciate the work that you are all doing, and the work that your professor has really focused on is a joy to me because it is so relevant to today as well as looking at our history. Jennifer Ross: What hurdles, both personal and political, have you overcome personally to get where you are today? Mayor Anna Peterson: Oh, I think one hurdle was . . . in getting my education. I married when I was right out of high school and so did not have a chance to go to college until a few years later. And it was wonderful because then I was in school at the same time that our children were in school. So we could study together, which was the good part . . . the bad part was that after I tucked them to bed, I’d continue studying until midnight, one o’clock, you all know what that’s like. And so having to juggle between the family and the education in order to really be ready to do the kind of work that I wanted to do, which was in journalism and in politics. So . . . that was one hurdle, but it turned out to be also one of the greatest experiences in my life; to go to college, to get a, to get a real education; a broad base liberal arts education. And nothing can be better when you’re a homemaker to have a professor say, “You must go home and read this Hemingway novel before the next class” [laughter]. It’s like, “Ok forget the laundry, forget the cooking I’m reading” [laughter]. Ok? Adam Barrett: Were you inspired by anyone in your life in particular to get involved in politics? Mayor Anna Peterson: Yes, I was inspired by Governor Tom McCall, and also . . . certainly by watching some of the national leaders in our country. And locally, really . . . knew several people in state government, Hardy Meyers who was a legislator, and Dave Frohnmayer who was a legislator and then . . . ran for governor and he was Dean of the University of Oregon Law School and then president of the University of Oregon. Dave influenced me from very early, very early on. Adam Barrett: Was there something, like do you remember any particular thing that he did that you really were just inspired by? Mayor Anna Peterson: You know, I was very interested in First Amendment law, when I was . . . started back to school and I was going to school at Portland State. And, I had an opportunity to be at a convention where he was, and I went over and talked to him about the First Amendment cases that he had worked on and some legislation that he had worked on to provide shield to reporters. And, I was so impressed, number one, that I could walk up to a legislator and actually talk to him. And then he, within two or three days, contacted me and sent me information from the bills. And I saw right there, that’s how a really effective public official responds when a constituent, although I was not in his district I was a constituent in Oregon, and he responded with information and encouragement. And, that was particularly important to me. A couple of other people that were very significant to me. Betty Roberts, who was in the legislature and then was on the Supreme Court, she was on the court of appeals, I believe, and then the Supreme Court. And I was always so amazed at how effective she was and how hard she worked; and yet she had retained a soft feminine side. And in the 70s there were . . . there was more of a… it was more difficult for women to get into politics, to get into business, to really be in leadership positions, and yet she was doing it all, and then sometimes you’d talk with her and she would talk about quilting and it taught me that you don’t have to become desensitized or defeminized in order to be successful. Kati Greer: What advice would you give to women looking to be more politically active? Mayor Anna Peterson: That’s a really good topic for me, because I am always encouraging . . . women and young people, but in particular . . . women to think ahead and to say yes. The thing I’ve noticed over the years is, and I’ve recruited so many people to do so many things, whether it’s in the arts or in historic preservation or in fighting methamphetamine or in supporting the music and the symphony and the youth orchestras, so many times I will call a man and ask a man to come on a board, to take a leadership role to do something, and they generally will say, “Well I, you know, I’ve got to balance my work,” and you know if they are in a large corporation maybe there’s someone they check with and you know of course they usually say, “Well I’ll check with my wife,” but they never start to tell me the reasons why they might not be able to do it. But often we women, when we’re asked to serve or to take on a responsibility or to do something that’s a stepping out, we first think of all the other people that need to be served by us before we can say yes, and . . . I know the experiences. I’ve raised three children. I know what it’s like to need to go to school and the child is sick or to go to work and you know they’re home ill, but women limit themselves. They think first of their family, they think of their husband’s schedule, they think of . . . what their family needs, and I’m not saying that that’s the wrong thing to do . . . but I see women closing the doors for themselves that . . . really they need to walk through, and so what I’m saying to people now is . . . “When are you going to be the mayor? When are you going to be the CEO? When are you going to be the head of the corporation? When are you going to be the senator? Now, are you going to be president? You know, we used to ask that question and it was sort of it was almost like a game, but I don’t think it’s like a game anymore, ‘cause I really think it’s serious and if we aren’t – if your generation isn’t looking ahead, if you’re not planning and thinking – the bus is going to come down the street and you won’t be able to get on, because you won’t be ready. You’ve got to be ready. It’s really crucial. Kati Greer: So, in light of that, you said that women have a tendency to say no and prioritize other things over political action, what do you think is the least time consuming way that women become active in their communities? Mayor Anna Peterson: It always takes time. If it’s worth doing, it’s worth doing well. And if it’s worth doing well, in order to do it well you’ve got to give it time. It is not something you can phone in. And be careful about what you volunteer to do, or what you sign up to do in your work, be careful that the thing that you’re committing your time to is truly going to achieve a goal. A goal for yourself, and a goal for the organization or the candidate or the issue or the activity that you’re signing up for. Is this really on point or is this a side issue? Are you getting drawn off by somebody else’s agenda? That’s what you have to be careful about, and it’s what I’ve talked with our council about a lot, and that is – you have to keep your eye on the ball, and you’ve got to keep your eye on your ball, not somebody else’s ball. We’re all out there at recess, and we’re all playing . . . playing kickball and ah, is this your ball that you’re kicking? Or are you suddenly kicking somebody else’s ball down the field? Good for them, not good for you. Gregory J. Garcia: How has your experience in education and the workplace changed over the years and influenced your job as a mayor? Mayor Anna Peterson: Well certainly education broadened my horizon, when I was about twenty-one one, twenty-two years old, I was becoming very involved in politics as a young Republican in Multnomah County, that was my very first entry. And I believed what I heard and I took everything at face value, let’s say, and what I learned when I went to school at Portland State, and started studying History and Politics and Economics and other things like Social Sciences and I began to understand that there can be so many sides to an issue and it’s not always just one sided. I’m . . . I’m still Republican although as mayor I’m non-partisan, but I learned fairly early on that I could be supportive of the candidate or the issue and be true to my values and that that candidate or issue may not be the candidate or issue of my particular political persuasion but I was thinking individually and independently. That’s really what education taught me was how to gather information and how to draw conclusions, and how to make an informed decision and that probably was the most valuable thing about going to school was hearing all of the different sides . . . and sometimes hearing a very, very slanted presentation by a professor and . . . maybe because of my age I was able to say to the professor privately while we were meeting in his office, “Did you think about presenting the other side of the issue? Did you think about presenting from another view?” And the looked at me and he said, “I never even considered it.” And I thought, “Boy, this is a teachable moment for one of us, I hope he figured out, who should’ve been learning at that moment.” So education helps us to open our ears and our minds and then be able to extrapolate what we’re hearing and come to conclusions. Gregory J. Garcia: And this professor you refer to was he in the Journalism Department? Mayor Anna Peterson: No, he was a Political Science professor. Gregory J. Garcia: How do you feel that journalism has affected your position as mayor? Mayor Anna Peterson: It’s helped me tremendously. I did get a degree in Journalism from the University of Oregon and I worked for a number of years in Public Relations, Media Relations, and in Marketing for various clients or for organizations that I worked for as an employee or as a board member, as a volunteer. And the journalism experience was very helpful in every one of those cases and is helpful today. For instance, when I’m contacted by the media and a reporter has specific questions for me, one of the first things I ask is “Are you on deadline?” Because if that reporter is on the deadline then they’ve got, you know, an hour or they’ve got two hours, they’re in a different frame of mind and in a different situation than a person who is gathering background information and has a couple of weeks and has time to talk with five more people and work out something. So that’s important. It also has helped me to understand what it’s like to be on the other side of the interview: why they’re asking questions and sometimes . . . the ability that they have or the inability that they have to ask the right question helps me to understand what I need to be telling them. If the reporter isn’t asking the right questions, and I feel like they’re not getting, you know, the real story, I will help them by telling them information that they’re not particularly asking for but is information important to the breadth of the story or the depth of the issue. And so, I think that is important and then also . . . frankly understanding when I’m being manipulated or used by a reporter or an interviewer and how to try to step around that. Brittney Teal-Cribbs: So, how has the role of women in community activism and politics sort of changed over the years, because you’ve been involved for many many years now [laughter]? Mayor Anna Peterson: I wish I could say it has changed substantially . . . and in some cases it has. More women are in leadership positions, more women are in elected positions . . . and yet there are still instances where I am the only woman in the room. There are still instances where, for instance I was at . . . an organizational conference, and the members selected the board of directors—and I’m a member of that organization. And there was one woman on the board, and there are, like, ten men. But it goes back to: why aren’t women stepping out . . . and part of the reason is because we often think of everybody else, or we . . . don’t assert ourselves strongly enough. But also it’s part of the culture to think of men in leadership roles. And I can’t tell you how many times I’m in meetings where we need a new candidate in an area, we need a new leader for an initiative. And men in the room will say, “We need a guy who can really do such and such and such and such.” And I say, “We need a person.” And, I love men! [laughter], I’m married to one! 41 years now [smiles]. But, if we don’t change our vocabulary, we won’t change the image that we have. If I tell you that my milk is delivered by a milkman, who do you think is driving that milk truck? You think of . . . it’s a man. Is it the mailman? Or is it the letter carrier? You know it’s just something as subtle as that. As far as women and politics and being active and being leaders . . . yes there have been some changes, but . . . we’re far from equal. And the other area where we really need, to be cognizant, is having a more diverse representation, on our city councils and in our legislature, and in our workforce, in the management ranks of our workforce. And that is something that I am keenly aware of. I call Salem an international city. And, there are people who have chosen to move here, and are living here and working here from all over the world. When I was out door-to-door I met people from Poland and Bolivia. From Vietnam, from China, from Sweden. From all over the world. Africa, many African, countries. And they’ve picked Salem, Oregon! We are an international community. And yet, it’s very difficult to find minorities who are ready, at this point, to come on to city councils or county commissions, and… so that’s another thing that we have to continually work toward. Because the demographics of the community have changed tremendously, but in elected office, I don’t see the changes as much as, I think the next generation really will make a difference. Certainly hoping. Travis Cook: What are some of the benefits and challenges that you’ve experienced as a female mayor? Mayor Anna Peterson: I have found the community to be tremendously supportive and . . . very kind and I don’t know if that’s just because all mayors are treated that way, but I think that people tend to be maybe a little more gentle with a woman. Which, you know, you can take it as it is and appreciate it. I don’t try to play off on it. I don’t try to take advantage that way. . . . I think that sometimes I’m looked at as an anomaly, a woman in a powerful position. Particularly in some other countries they’re surprised that a woman would be the mayor, but particularly in Asian communities more so maybe than European communities. I think one of the benefits of being a woman as mayor is that I have the ability to look at the family and look at the neighborhoods and see how our rules and ordinances affect family life because I remember what it’s like being in the neighborhood and raising our children and working with park systems and school systems. I think the other thing that is a challenge is the . . . the issue of credibility. I have a lot of girlfriends who were very successful women and we all know, that we had to absolutely work harder and do better because we didn’t want to let each other down. Justin Devereux: Mayor Peterson, when people vote, is it justified for them to take gender in consideration, or should they, in your opinion, just vote, or should they just look at people as just citizens of the state? Mayor Anna Peterson: Well, I’m a strong believer that, that you need to look at the individual and I never thought that anyone should have an extra credit because that person is a woman, or because that person is a minority, or because that person is a man. So I try very hard to look beneath the surface. What are the issues that person supports? If that person is tightly aligned with an organization, what are the values and mission and goals of that organization? Because if that person is elected, that organization’s mission and goals will be that person’s agenda, or part of that person’s agenda and I don’t mean that negatively, it could be very positive. But I do think that you have to look at what individuals stand for, so that you can lift up that layer and see what’s underneath that understanding, what’s underneath that support. Why does that person support or align themselves with a particular issue or coalition or belief? If that seems solid, then to me, that person is more credible. If I look beneath that layer and I see “Oh, that’s a channel for . . . political contributions,” do I think that person really believes those things or is it just that they believe the money stream? And in politics you have to look at that, so that you know who you’re really electing. Are you electing the person? Are you electing the money that got them to where they are? For me, it just has to be the person. I worked at the University of Oregon for a number of years after I got my Journalism degree. I remember an association of women administrators, and they were trying to achieve more respect for women administrators and, greater parity and they had formed an association of women administrators. I wasn’t very well received because I went to a meeting with them and my comment was, “I’m not sure that we’re going to gain anything by sitting in this meeting together as women alone because the men that run this campus are over there . . . and they’re making the decisions and we’re not.” And I didn’t get invited back [laughter] to the group. But I do believe that, if you want to make change, integrate into the organization that you want to change, so that you begin to understand that organization and/or that group of people or that coalition and begin to understand their philosophy and then you can see how to make change within. Because, frankly, I just don’t think that you can be as effective on the outside, hammering on the wall, as you can be when you’re inside at the table. So, I think that has something to do with women and do women look at themselves as a part of the unit, or do they look at themselves as a person aside that’s going to pound on the door, but maybe not have the tools to be able to be inside. Kimberly Jensen: Mayor Peterson, we’re very grateful for the time that you have spent with us today and also your willingness to participate in this program as part of the centennial of the achievement of suffrage. And we also celebrate your contributions to Oregon women’s history and to Oregon history. I’m just wondering if there is anything that you would like to add or that you feel, ah, you’d like to have part of this interview given that hundred-year context. Mayor Anna Peterson: I’d like to just say thank you so much to you, professor, for even framing this opportunity and for helping students to understand the value of the history of women’s suffrage and the history, particularly here in Oregon, because it is a wonderful history. We have had dynamic women leaders in our state, as well as men, and I think that what you are studying and what you are discovering with these interviews is that each individual adds to the fabric. And you each add to the fabric, what you’re doing will add to that as well. And I thank each of you for taking time and, obviously, you’ve put a lot of thought into the questions, they are great questions, and I’d like to be interviewed by all of you all the time [laughter]. This is fun. So thank you. Are you all in the same year in school, or different years, or . . .? Kimberly Jensen: All beginning the Master’s Program in History, so . . .
Mayor Anna Peterson: I see, ok. And it’s a two-year program? Mayor Anna Peterson: So is this the first semester? Or is it terms? Kimberly Jensen: We are on terms. Mayor Anna Peterson: Ok. Terms. Great. Well, I envy you. Those school years were, even though I was folding laundry at midnight, they were fabulous years. I loved being a student. They’re the best years you’ll ever have. Make the most of them. This is great. Come and talk to me any time. I love meeting with people and if you have ideas, thoughts about what we’re doing in the city of Salem, ah, you want to share those, anytime you think that there is something that we could be doing better or if there is something where we have missed out, please let us know. That’s the only way we can grow and be better as a city is listening to people. Kimberly Jensen: Thank you so much, Mayor Peterson. Mayor Anna Peterson: Well, thank you, thank you all.